On January 30th, 2018, the BC government decided to drop the private prosecution launched by Bev Sellars into the Mount Polley disaster. Through her private prosecution, Bev, a grandmother and former chief of the Xat’sull First Nation, gave the provincial government a second chance to show that BC can enforce its own environmental laws. They let that chance slide away, and let us all down – while demonstrating fundamental problems with how the province deals with charges laid by members of the public against environmental offenders. We all know the basics. On August 4th, 2014, the dam holding back a tailings pond at the Mount Polley mine above Quesnel Lake collapsed. Around 24 million cubic metres of mine tailings – containing toxins like arsenic, mercury, selenium, lead and copper – tore through the breach and down Hazeltine Creek into Quesnel Lake. Quesnel Lake is a source of drinking water and vital habitat for about a quarter of the province’s sockeye salmon. That toxin-infused sediment is still on the lake bottom, and the mine is still discharging wastewater directly into Quesnel Lake. Mount Polley was the biggest mining disaster in Canadian history, and it is ongoing. So on August 4th, 2017, the last day possible, Bev Sellars (with help from our Environmental Dispute Resolution Fund) laid her own charges – pointing out that even on the basis of the public record there were grounds to charge MPMC for violating BC’s environmental laws. In doing so, she asserted the right to hold the company accountable, but also held the door open for the Province to step in, take over the case and enforce its own laws. Bev alleged that MPMC had violated conditions of its operating permit, and provisions of the Environmental Management Act and the Mines Act. There were three options for what could have happened next. Option 1: The Province could have taken over the charges Bev laid and prosecuted MPMC. It is very expensive for individuals to run prosecutions, and arguably it’s the government’s job to enforce the law, so this would have been a good outcome. Option 2: The Province could have allowed Bev to continue her private prosecution, while declining to get involved itself. This would have required Bev to do a lot of crowdfunding, but it would have been the second best option. Option 3: The Province could take the private prosecution away from Bev and stay (drop) the charges. This is what they did. On January 30th, the BC Prosecution Service announced that it was going to take over Bev’s charges against MPMC and drop the case. Why? Because it determined that the charges did not meet the charge assessment standard. The “charge assessment standard” is the Prosecution Service’s policy of assessing whether pursuing criminal charges is in the public interest, and whether those charges are likely to result in a conviction. In other words, the Crown prosecutors did not think that they could successfully prosecute MPMC under BC laws, or they did not think it was in the public interest to prosecute the company responsible for the largest mining disaster in Canadian history. Either result is disturbing. Bev has said it best: “if prosecuting this case isn’t in the public interest, I don’t know what is." It is surprising that the Crown prosecutors did not think they could have succeeded in prosecuting Bev’s charges. One of the charges simply required evidence that there was a spill, and that it had released contaminants into waterways without treatment. Here is a video of this happening. If Crown prosecutors really did not believe that they could have succeeded in prosecuting the charges against MPMC, this means that BC’s laws for environmental protection are so weak that even the largest, most well-documented mining disaster in Canadian history does not violate them. The government has repeatedly pointed out that it is contributing to the ongoing federal investigation into the Mount Polley disaster under the federal Fisheries Act, and that charges under federal laws may still be laid. Co-operating with the federal investigation is good, but it’s not enough. Why bother to have provincial laws if we don’t enforce them? And after a three-year provincial investigation into Mount Polley failed to result in charges, can we be confident that BC will ever lay public charges for environmental offences? We need law reform that forces the mining sector to clean up its practices and that protects the environment. Much has been written about the desperate need to reform BC’s mining legislation, which has remained pretty much unchanged since the 19th century gold rush. The BC Auditor General called for reform in 2016, and the University of Victoria’s Environmental Law Centre has called for a full judicial inquiry to fix systemic failures in our province’s mining regulation. West Coast supports these calls for change. But we’re going to focus here on another thing the Mount Polley disaster has thrown into sharp relief: the need to reform BC’s private prosecutions policy. What are private prosecutions, and why do they matter? Illuminated manuscript depicting the Court of King's Bench, England, 1406. A prosecution is the process of laying charges against an alleged offender and taking that case through the courts. A private prosecution occurs when a private citizen lays the charges, whether under the Criminal Code or the “quasi-criminal” provisions in provincial environmental laws (for example, violating certain provisions of the Environmental Management Act). Private prosecutions date back to England in the Middle Ages, a time when private citizens had primary responsibility for enforcing criminal law. Canadian courts have long recognized private prosecutions as a part of the laws of Canada. Today, the federal government describes private prosecutions as a valuable constitutional safeguard. Private prosecutions are a tool that citizens can use in the event that the authorities fail to enforce the law, whether through inertia or partiality. When that happens, private prosecutions allow citizens to step in and uphold the rule of law. In a world without private prosecutions, we would be utterly dependent on provincial and federal government prosecutors to enforce our laws. This would be a concerning scenario, especially if the prosecutions branch were underfunded and/or understaffed (as they often are). As we have written previously, BC has been growing steadily weaker on enforcement against environmental offenders since the early 1990s. And yet, private prosecutions are effectively not allowed in BC. Generally, [BC Prosecutions] Branch policy does not permit a private prosecution to proceed. Crown Counsel will usually take conduct of the prosecution or direct a stay of proceedings after making a charge assessment decision. While the words “generally” and “usually” imply that the Province allows at least some private prosecutions to proceed, in practice this is not the case. To our knowledge, all provincial private prosecutions in BC are stayed by the Crown. Thus, the government’s decision to stay the charges against Mount Polley Mining Corporation wasn’t an exception: it’s the rule. BC’s private prosecutions policy needs to change. It is deeply disturbing, as Premier Horgan said, that no charges were laid under provincial laws over the largest mining disaster in Canadian history. It is equally disturbing that when Bev stepped forward to hold MPMC accountable, the province wouldn’t allow the prosecution to proceed. Private prosecutions safeguard important constitutional values, and a policy that effectively blocks them from proceeding undermines public confidence in the law – particularly in a province that hasn’t been enforcing its environmental laws. Obviously we think the government should be enforcing its own laws, but in the absence of strong enforcement it’s also important to have a policy that allows individuals to step in when needed. The federal government and the government of Ontario have policies that allow private prosecutions with merit to proceed; we should be looking at those policies and reforming our own, to ensure that British Columbians have the ability to hold environmental offenders to account. 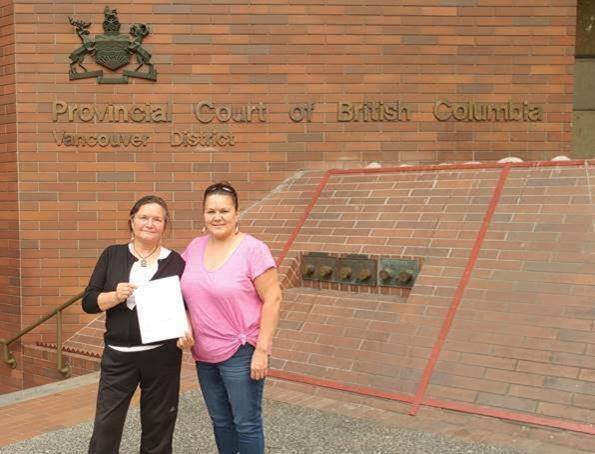 Top photo: Bev Sellars and Jacinda Mack outside the Provincial Court of BC filing the provincial prosecution against MPMC.